DOVER, Del. 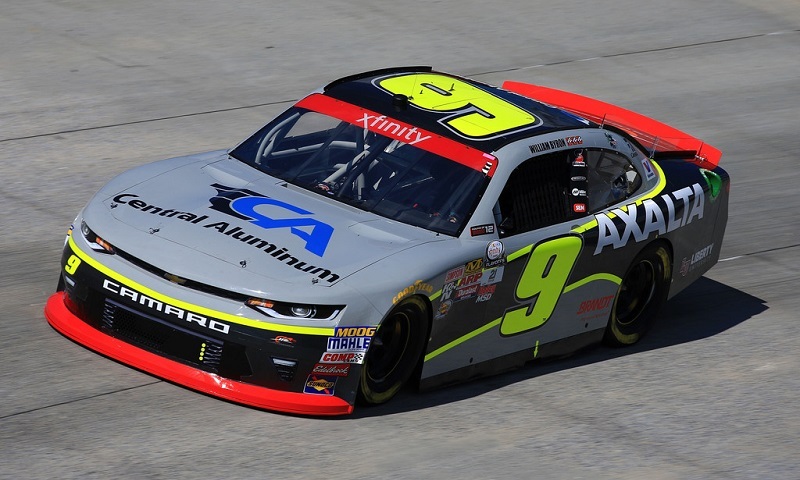 – William Byron converted his pole starting position into his third NASCAR XFINITY Series stage win of the season Saturday afternoon at Dover Int’l Speedway. Byron led the first 60 laps of the ‘Use Your Melon’ Drive Sober 200 uncontested and earned a playoff point for his efforts, pushing his postseason total to 26 as a result of topping the caution-laden opening stage of the race. He survived three restarts during the stage and reached the green-checkered flag .759 of a second in front of Monster Energy NASCAR Cup Series regular Ryan Blaney. Blaney ran Byron down towards the end of the stage on the high groove, something that the young rookie said he would be looking at utilizing as the race went on. Byron took off from the pole position on the initial start and held outside polesitter Daniel Suarez at bay before a spinning Brandon Jones collected Jeff Green in Turn 4 to draw the first caution of the day on lap six. Racing resumed on the 14th round and again saw Byron pull away as Suarez battled a very loose race car through Turns 1 and 2, but a second early issue drew another caution as Harrison Rhodes went up in smoke on lap 19 with an expired engine onboard his No. 01 Chevrolet. That was followed by a Chad Finchum crash on the backstretch barely a lap after the next restart, setting up a green flag resumption halfway through the stage on lap 30. Byron played out the same move over Suarez to assume command from the outside lane as he had on every restart prior, opening up a full second over the field by lap 40 as the longer green flag run allowed certain drivers to pick their ways through the field. The most notable of those was Blaney, who charged from fifth to second during the 31-lap run before the stage break, with Suarez, Justin Allgaier and Erik Jones crossing the line third through fifth, respectively. Elliott Sadler, Tyler Reddick, Cole Custer, Daniel Hemric and Brennan Poole completed the points-scoring drivers inside the top 10 at the first stage break of Saturday’s race.